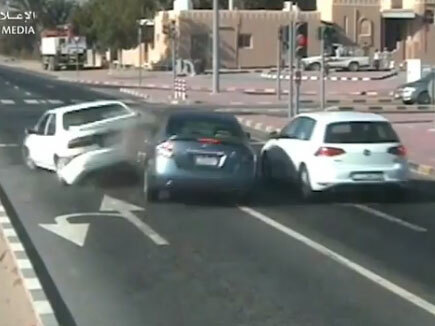 Abu Dhabi: Police are warning motorists about the dangers of distracted driving, and have released footage taken from CCTV to illustrate their point. The video, which was uploaded on Saturday, shows viewers how a distracted driver speeds towards a traffic light junction without realising that another vehicle has stopped in front. Police across the emirates have launched the safety campaign “Avoid distractions while driving”, as part of the Ministry of Interior’s awareness drive to reduce traffic accidents on roads. Lt Col Saif Abdullah Al Falasi, Director of traffic and patrol department at Ajman Police, said the campaign was launched to educate drivers, road users and members of the community about the dangers of distracted driving, such as using mobile phones and online apps. According to Article 32 of the UAE Federal Traffic Law, handling a mobile phone while driving – whether to take photos or write messages – will lead to a Dh800 and four black points. Using mobile phones while driving could lead to dangerous consequences, including traffic accidents and congestion. On its social networking sites, the Ministry of Interior asked social media users whether mobile phones, applying make-up or, unruly children or food and drinks were the main cause of traffic accidents. While some social media users said all of the above were responsible for accidents on UAE roads, others said it was a combination of speeding and mobile phones. @abu_mahamed_ayham said: “I think there are more reasons for accidents, but most of them happen because of the use of the mobile phone while driving, as well as not leaving enough distance between cars. Speeding at the traffic signal is also very dangerous because you do not know if the car in front will pass the yellow or orange light”.